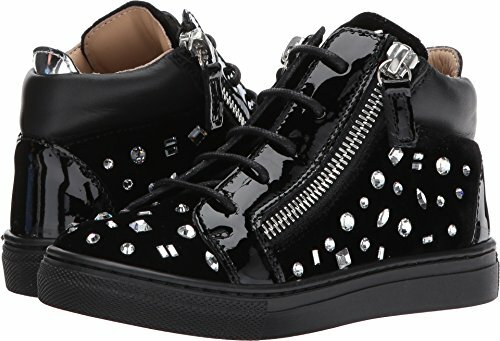 Unmistakable style in a truly unique sneaker will be your little one's to share with all they come in contact with the help from Giuseppe Zanotti Kids™. Suede leather upper features stunning sparkling stone appliques adorned throughout. Lace-up closure connected through unreinforced eyelets. Dual functioning side zippers for easy on and off. Pull-on design with decorative pull tab in back. Round-toe silhouette. Leather lining. Lightly padded leather insole. Durable rubber sole. Made in Italy. This item may ship with an attached security tag. Merchandise returned without the original security tag attached or a damaged tag may not qualify for a refund. Measurements: Weight: 10 oz Product measurements were taken using size 32 (US 1 Little Kid), width M. Please note that measurements may vary by size. Pull-on design with decorative pull tab in back. Round-toe silhouette. Leather lining. Lightly padded leather insole. Durable rubber sole. Made in Italy. This item may ship with an attached security tag. Merchandise returned without the original security tag attached or a damaged tag may not qualify for a refund. Measurements: Weight: 10 oz Product measurements were taken using size 32 (US 1 Little Kid), width M. Please note that measurements may vary by size. If you have any questions about this product by Giuseppe Zanotti Kids, contact us by completing and submitting the form below. If you are looking for a specif part number, please include it with your message.